My cat Loki was my very first pet when I moved out of my parent’s house right after college. He’s almost 13 years old now, and he means the world to me. 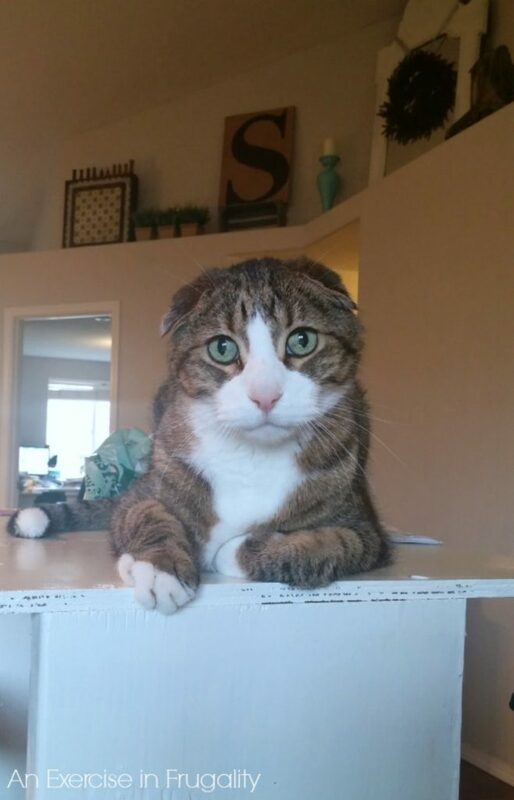 He’s a special kitty who has been through a LOT in his lifetime (including an ear infection that caused hematomas leaving his little ears permanently floppy)! Last December we flew to Minnesota for Christmas. 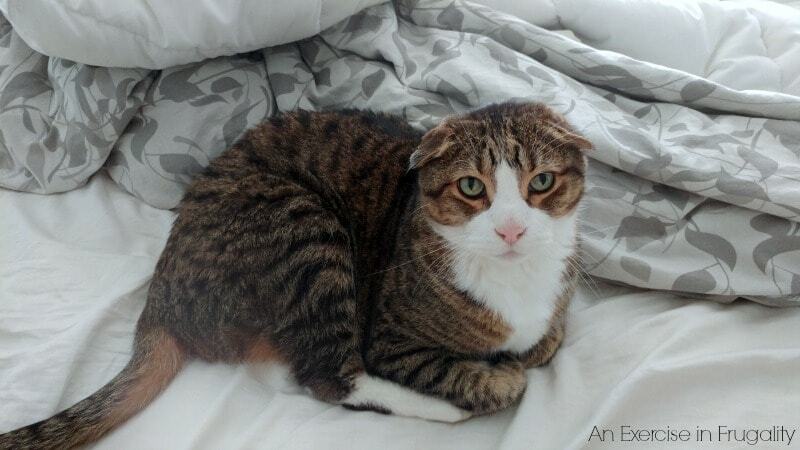 We used an online service before to book a pet sitter, and were happy with her, so we booked her again for our trip. We had never used a pet sitter prior to that. In the past we always had family and friends that lived nearby who we trusted with our cat and dog. I chose someone who sounded nice based on their profile, we met her once before we left her with our pets, and we felt comfortable with her because she seemed like she knew what she was doing, and the agency was reputable and had good reviews. The day we returned home, our sitter had left for her other job in the morning and was going to return that night to take care of the pets, but we told her we would be home in time so she didn’t have to come back that night. She had stayed overnight several days, walking the dog, and feeding the dog and cat. We returned home that evening to find our dog, Bear, acting kind of unusual. He was pacing around barking like he was trying to tell us something. I walked around the house trying to find Loki, but couldn’t find him anywhere which is odd because he usually runs to greet us at the door like a dog. I was starting to get nervous. I searched the house top to bottom and soon heard faint meowing like he was trapped somewhere. I opened every closet and cabinet and then something caught my eye out the back door. There was my beloved Loki, locked outside IN DECEMBER. I frantically let him in, and because of cowering in the cold all day, his arthritis flared giving him a severe limp. I quickly realized he had been locked outside since the sitter left that morning….12 hours earlier. Eventually, the sitter was “fired” from the pet sitter listing service. Her carelessness (she later told me she overslept and was in a hurry to get to her “real job”) could have cost my pet his life. 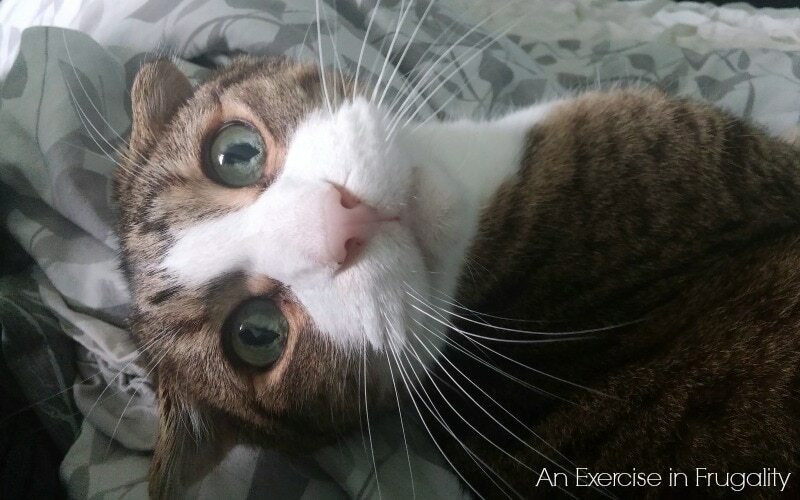 I was so upset, I swore I would never use a pet sitter again. 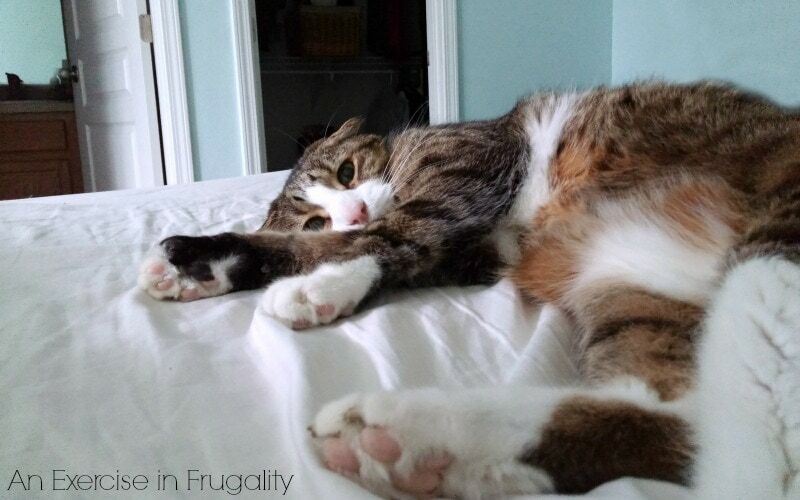 Fast forward to present day, and we are finally ready to consider another pet sitter. To further complicate our fears, my sweet Loki suffered a heart attack a few months ago and now requires life-saving medication twice daily to manage his heart and thyroid. Another irresponsible college kid sitter is NOT an option for us. We need to find someone who is trustworthy, knows what they are doing, and pays attention to the animals in their care. 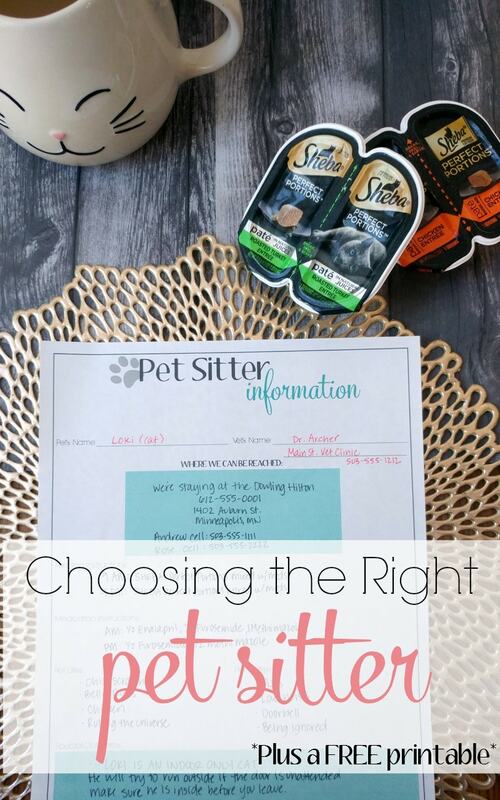 I did a lot of research in preparation for our next trip and I wanted to share with you some tips for choosing the right sitter for your pet. 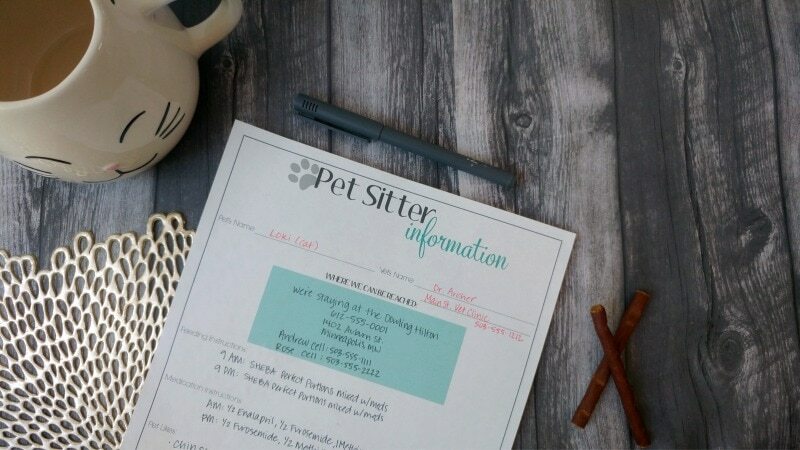 I’ve also created a free printable which you’ll find at the end of the post that has places for all your pet’s important information and detailed instructions for your sitter. Ask for recommendations– If you have a friend or neighbor with pets, see if there’s anyone they recommend. You can also ask your local humane society or even your obedience school trainer for someone they trust. Check with the National Association of Professional Pet Sitters (856-439-0324) or Pet Sitters International (336-983-9222). Interview candidates before hand. Ask for references and CALL those references. Observe them with your pets. Try using them for a one night stay while you’re local to see how they do before you commit to using them when you’re out of town. Look for someone with insurance. If your pet is injured while in their care, you should not be paying the vet bill. Have your neighbor keep an eye out. Ask your next door neighbor to watch for anything unusual-if they don’t see the sitter come by the house, or if they hear unusual amounts of barking or meowing from your home it could indicate a problem. Give them your number and ask them to call you if there’s any sign of trouble and offer to do the same when they go out of town. Trust your instincts. If something doesn’t seem right about the sitter, choose someone else. Also, ensure that you have enough food and treats for your pets for the duration of your trip, plus extra in case there’s a delay in your return. With Loki’s medication, he requires his pills to be crushed and mixed into wet food. He’s exceptionally picky however, and will only eat certain wet foods (and only in certain flavor varieties!) so I have to be sure I have enough on hand for him to get his medications twice daily. The SHEBA® PERFECT PORTIONS™ wet food is perfect for this, since its two “perfectly portioned” trays each sealed individually. This makes dosing his medication super easy and there’s no messy can of cat food in the fridge waiting for his next dose. He apparently has a very refined palate and is highly selective about the food he is served! He generally prefers the Cuts in Gravy varieties, as do I because it makes mixing in the crushed medication so easy. 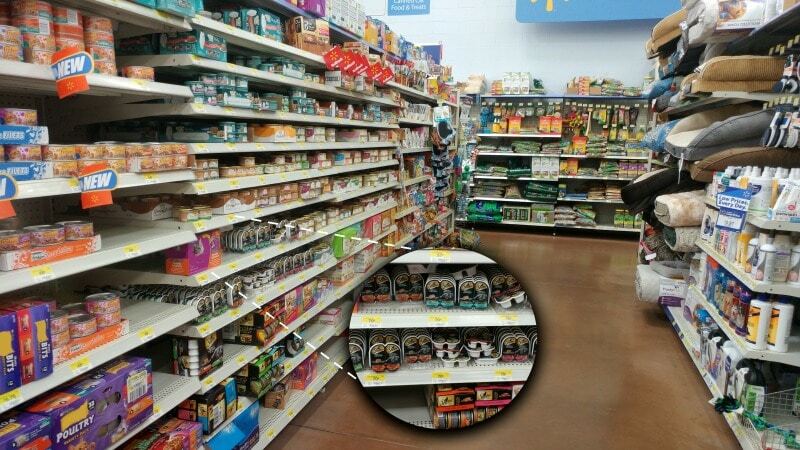 You can find them at Walmart in the pet food aisle. I like to have treats on hand too when a sitter comes. Treats are a very rare occurrence with our pets, and so I feel that providing them when a new sitter comes creates a positive correlation and helps alleviate fears. Since Loki is generally skittish around new people, I know he is more likely to come to a new person if that person is holding delicious treats like the SHEBA® Meaty Tender Sticks. They are individually sealed for freshness which is perfect because we don’t give them out often and its important that they stay fresh! Loki loves them because like their slogan says it’s SHEBA® WHAT CATS WANT™. I love them because they are made with real meat and no artificial flavors. We’re choosy about what we feed him due to his medical conditions, and I like that there’s no junk in there. Not many people give their cats treats, but let me tell you, they enjoy them just as much as dogs do from time to time! So, reluctantly I know we will have to start interviewing new pet sitters soon, but I feel more confident going into it this time knowing what I know now. I wanted to share this information with other pet owners so that no one has to go through the scary situation we went through (or worse, the loss of a beloved pet) due to a sitter’s carelessness, negligence or misunderstanding. 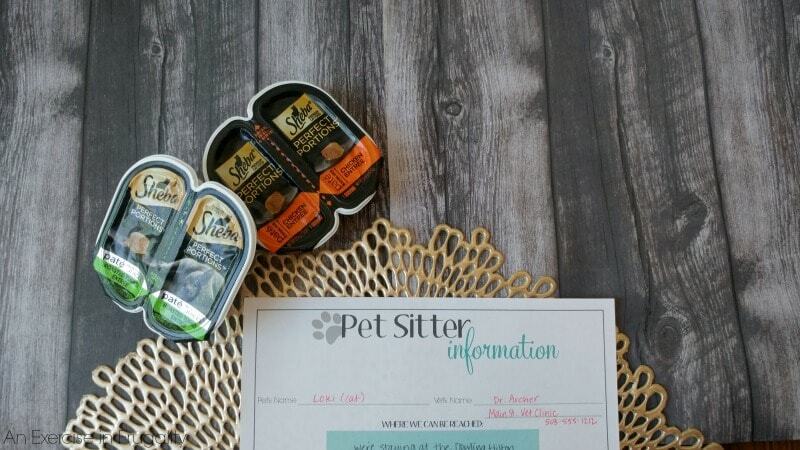 Be sure to download your FREE printable pet sitter information here. You can print as many times as you need it, just please don’t sell it, redistribute it or claim it as your own. Feel free to share the link to this post with your friends if you think they’ll find this info useful. Find more #PerfectPortions inspiration here. 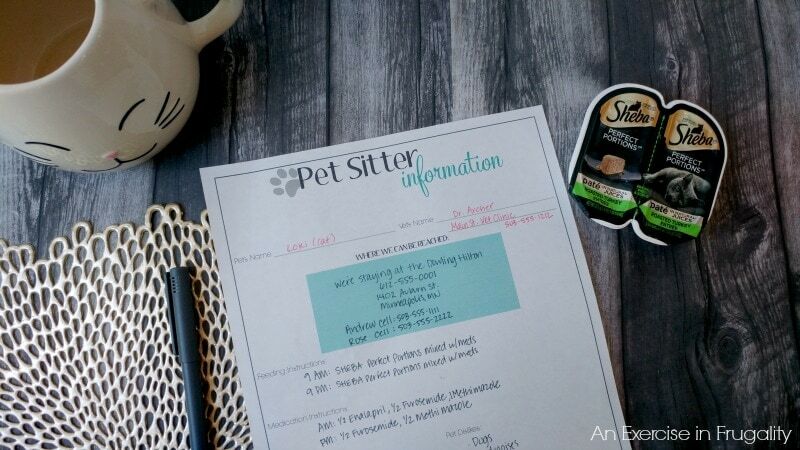 Don’t forget your free pet sitter information printable too! I haven’t used the site care.com yet, I only recently discovered it as part of my own pet sitter search, but it seems like a good place to start as well. Loki is adorable, I hope she lives a full life despite her challenges, she is a fighter! Awwww, how adorable Loki is with those ears <3 such a cutie! I would love to post you article on my site! You are 100 percent right! 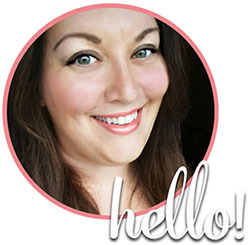 I am an insured and bonded pet walker/sitter, which is an LLC. I also have animal CPR and first aid. Yes, I am bragging. But you want the person who cares for your babies to be responsible. Besides volunteering for the SPCA, it is my real job. No sleeping in late. Care.com and Thumbtack have both been decent sources for me to get clients, and it is free for consumers to request quotes. Always get references and try to stick with a person, not an agency. It keeps communication cleaner. Amen. I am a responsible pet care provider with insurance, bonded and licensed. I took the Red Cross Pet Safety and First Aid course and am certified in pet safety and CPR. This IS my job and the pets in my charge are loved dearly. There are so many individuals out there touting they love animals and want to pet sit on the side. Do not be taken by these people. Hire someone with you and your pets ‘best interests at heart. Also consider Pet Sitters Associates, LLC as a reputable source for pet care providers. I am insured and bonded through them. I am a pet nanny and I agree with all that you have said and thx for posting this! Excellent article! I am a sole proprietor of a pet sitting business, and you definitely covered the important areas when interviewing. That’s why I board my pets at the vets office. Staff trained to dispense meds, housed safely & veterinarian available if needed.